The most humble cut of meat turned into a tender, rich and flavorful gourmet main dish or the ultimate over the top sandwich. Beef Neck Bones ain’t on the menu in this generation of the Browns too often, but they were a weekly affair when I was a kid. But every now and then I have to go “there” to show respect to my culinary forefathers, showcase my skills, and just grub-out to some cheap, gutter, grimy good food. When you can take some humble ingredients like beef neck bones and make it into pure tasty bliss you got skills. What are beef neck bones? I describe beef neck bones as poor man’s or hood beef short ribs. It’s just as tender but less fatty than short ribs and even it’s cousin oxtails. As much as I love neck bones, I hope they kinda remain a best kept secret and not go the way of oxtails. Next thing you know, neck bones will be appropriated like them and we’ll be paying $20 a pound. Why a beef neck bones sandwich? The first time I made this recipe I had just listened MonoNeon’s then new album “A Place Called Fantasy.” It was so dope and funky it made me go by a bunch of neck bones in all seriousness. Now everytime I listen to this album I hve neck bone cravings. 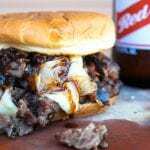 Such was the case when I recently remade this beef neck bones sandwich. If you don’t know MonoNeon you need to check him out. A true motherfunker, he kills it in a George Clinton, Bernie Worrell, Bootsy Collins kinda way paying homage to the funk forefathers, while bringing in his own great fresh sound. I listened to about three rotations to the album and then decided I needed to make an impromptu neck bones run. 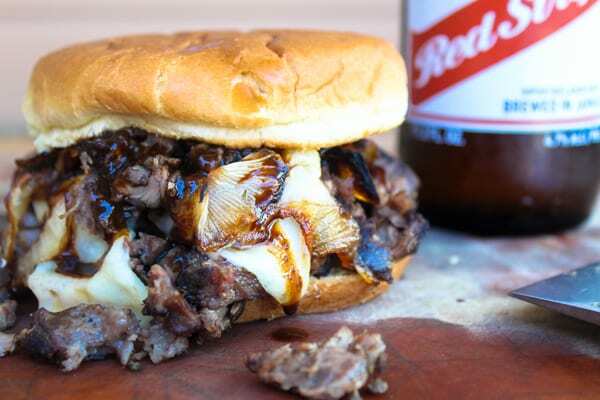 I came up with two – this yummy sandwich idea and then a more traditional soul food recipe which for me as a kid was beef neck bones slow simmered in a vinegary based broth a recipe I’ll share at a later date. 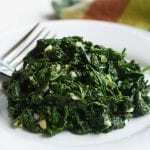 But I figured like MonoNeon, I’d pay homage to a familiar dish with my own spin on it. 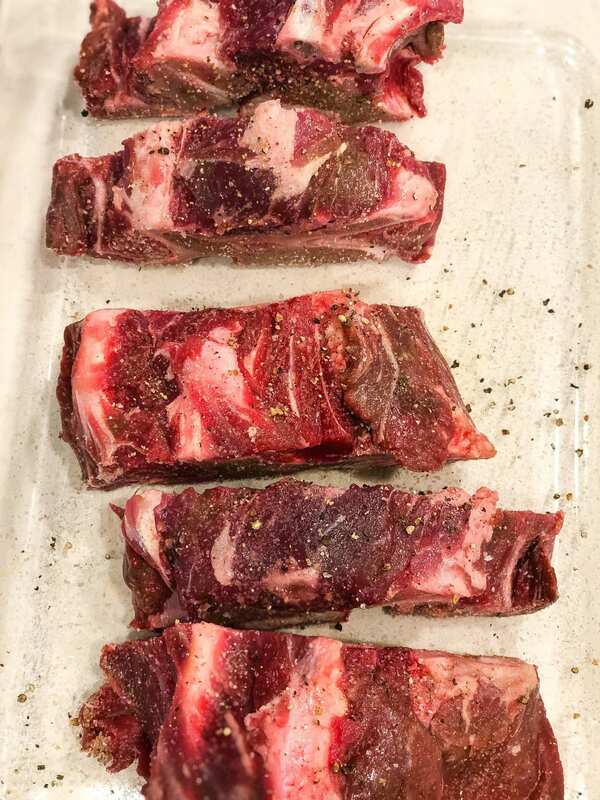 Now, I know beef neck bones ain’t the most popular meat on the grocery store roster, so feel free to substitute beef short ribs in the recipe. Neck bones are best cooked via a traditional braising approach. Slow and low cooking is perfect for breaking down an otherwise tough cut of meat. A wine based braising liquid along with caramelized vegetables like onions, celery and carrots help provide an unmatched depth of flavor. And even better, the results leave behind a policer gravy that is mucho sop worthy; just be sure to have some good crusty bread on hand for steady soppin’! You can stop after braising and enjoy these deep, flavorful meaty neck bones as is. Or you can go next level with them, and use the meat to make this delicious, decadent braised beef neck bones sandwich. 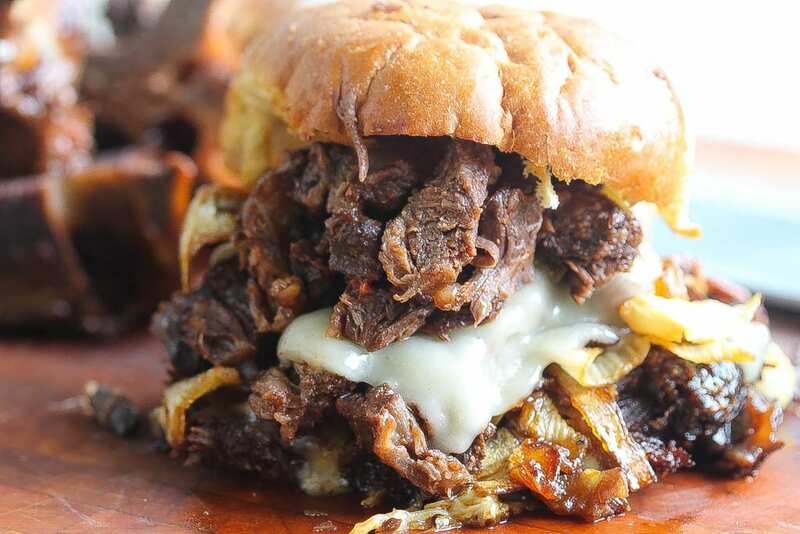 This is a riff on a classic beef short rib sandwich. Neck bones are similar to oxtails and short ribs, but without the same amount of fat. I piled the tender pieces of goodness sky high on top of a brioche bun, added caramelized onions and fontina cheese, then topped with a homemade beer sauce. How do I ensure the finished neck bones are tender and not tough? Are there other methods of cooking neck bones? I’ve used a sous vide to cook the neck bones for these sandwiches, in the past. If cooking sous vide cook in plastic bag with fresh thyme for 20-24 hours at 125 degrees. Slow-cooker is another option, but just be sure you sear the meat first to not only ensure tenderness, but also for purposes of maximizing flavor which can be a challenge somewhat with crock-pots. I haven’t used an Insta-Pot yet, but can see it working well. 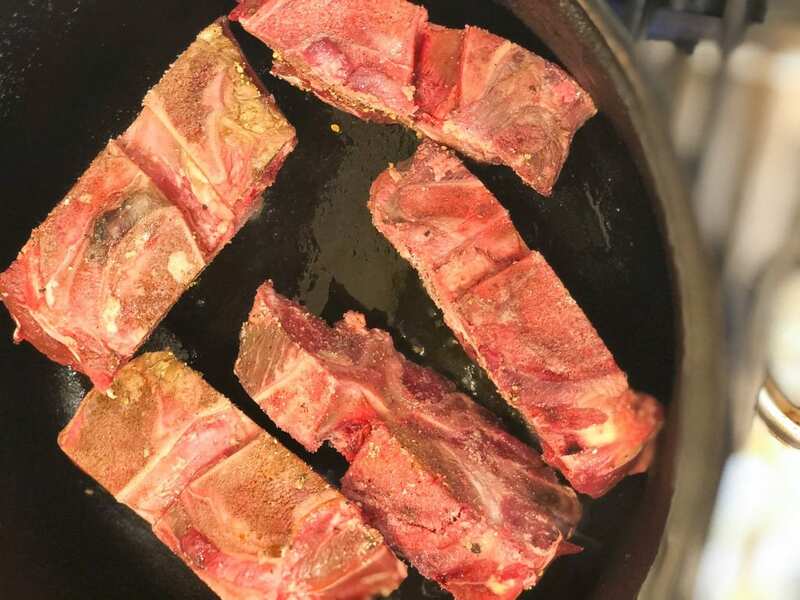 Are Neck Bones good for bone broth? Neck bones are perfect for beef bone broths. Neck bones have a lot of collagen which is what gives the broth both body and rich flavor. 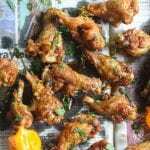 They also have much meat, which helps prevent that sour, off flavor you sometimes get with roasted bones. If you make this crazy, ridiculous and off the charts braised beef neck bones sandwich, please come back and leave me a comment below with your feedback. Definitely take a photo of the dish and be sure to tag #foodfidelity so that I can see them. For another recipe featuring a humble meat turned into gourmet magic, try this braised ham hocks recipe or for another yummy sandwich idea try this Grilled Cheese with Andouille Sausage. Humble beef neck bones braised to fall off the bone tender perfection then assembled into a sandwich with caramelized onions and a homemade beer sauce. Rub the outside of the neck bones with salt and pepper. 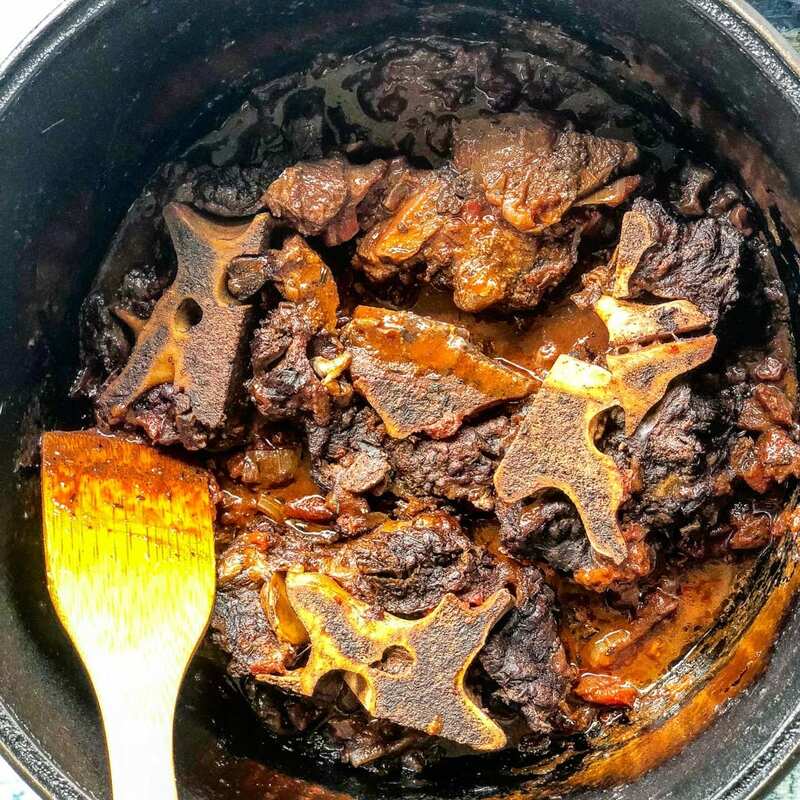 In a large skillet over high heat, brown the neck bones on all sides. Set aside and reserve. Add carrots, onions and garlic to the pot and saute 3-5 minutes. Season with paprika and additional salt and pepper. Add the stock, wine, bay leaf, and tomato paste. Mix well then add the neck bones back to the pot. Bring to a boil then reduce to a simmer and cooking on low for 4-6 hours. Remove neck bones and let cool slightly. Pull the beef away from the bones and chop. Beef should be tender and easy to pull apart. Coat the bottom of the pan with olive oil. Heat the pan on medium heat until the oil is shimmering. Add the onion slices and stir to coat the onions with the oil. Spread the onions out evenly over the pan and let cook, stirring occasionally. Depending on how strong your stovetop burner is you may need to reduce the heat to medium low to prevent the onions from burning or drying out. After 10 minutes, sprinkle some salt over the onions, and if you want, you can add some sugar to help with the caramelization process. If they start to dry, add a little water and stir. Let cook for 30 minutes to an hour more, stirring every few minutes. As soon as the onions start sticking to the pan, let them stick a little and brown, but then stir them before they burn. Combine beer sauce ingredients in a small bowl; stir with a whisk. Add mixture to a sauce pan; bring to a boil, scraping pan to loosen browned bits. Cook 3 minutes or until liquid is reduced by 1/2. Top bottom bun with chopped neck bones, onions, and slices of cheese. Broil in oven at high settings to melt the cheese for five minutes. Top with sauce and top bun. Heat olive oil on medium-high heat in a Dutch oven. Sprinkle all sides of the beef with some salt and pepper then brown on all sides; set aside. In the same pot, add the onion (add more oil if needed) and cook until the onion begins to soften, 1 to 2 minutes. Add the garlic and carrots, cooking for another 2 minutes. Deglaze the pan with the red wine and by scraping the bottom of the pan with a wooden spoon.